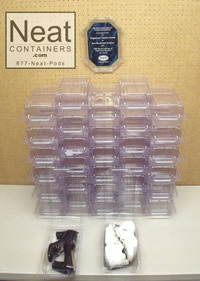 NeatContainers.com now offers a great new item for those in high humididty areas. An easy to read indicator lets you know how much moisture is in the area all at a glance. And since our containers are clear its a perfect fit. You can see how your items are doing moisture wise all in the blink of an eye. These make a great companion to our moisture control dessicant bags. Try them today there are only 4 for a dollar! Iam self Diagnose OCD!!!!! I am so surprise and at the same so disappointed that this product is not selling everywhere. I love it so much ....... life is so much easier now. I also get to wear those shoes that always get stuck at the bottom of the pile!!!! Million thanks to the inventor, you have made women everywhere dreams come true.... ha ha ha PS...... I'm Single and Love a man who can organize, especially my shoes ha ha ha.. I purchased this product to rid my closet of the plastic box ..